City Joinery is a Brooklyn based company making new furniture one piece at a time. The company was founded in 1996 by Jonah Zuckerman at one end of his loft on Flatbush Avenue. Fed up with living in the same space as the table saws, Jonah moved City Joinery to Dumbo in 1998, where a workshop and small showroom could accommodate the growing business. By 2004 the company expanded into its current 6000 square foot home on Jay Street. City Joinery was founded by a Harvard-trained former architect whose design influences range from Mackintosh to the Danish modernists. Continuing this legacy of designer-craftspeople, they enjoy the challenge of balancing practicality and artistry. And as with forerunners such as Ruhlmann and William Morris, they take pride in cultivating relationships with our clients, in crafting the objects that will inhabit their homes or offices for generations. City Joinery furniture captures the vitality of our time. Deeply respectful of traditional technique and style, their design approach also questions and enlivens some of the very traditions it employs. Yet because of the great attention spent on details, the richness of the materials they use and the deep, satisfying luster in the finish, the furniture stands outside the whims of fashion trends. It is as much of our time as it is timeless. Their designs are contemporary: pared down forms, taut lines, unexpected and sometimes contrasting surfaces. They work primarily in solid wood, not veneer, and often in combination with other materials such as metal, glass, upholstery and acrylic. From dining tables, beds, and armoires to desks, dressers, and seating, we have a large array of designs. They make myriad variations on these in different woods, sizes and with different details. They can also create a new design specific to a customer's needs, space constraints and tastes. City Joinery furniture is made from solid wood because, unlike most veneered substrates, it has integrity, depth and strength. Their furniture is carefully designed to allow the wood to breathe with changes in humidity. They seek out woods that have subtle color variations and grain patterns and they prefer to finish them in a way that emphasizes these natural subtleties. Each piece they make gets a thoughtful, careful approach. This shows in the finished product and its quality appreciates over time. 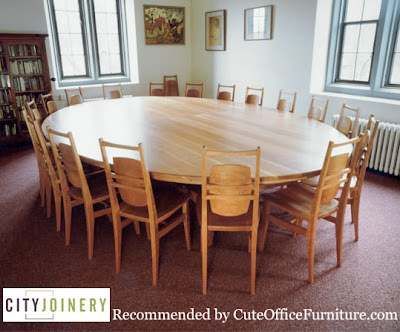 City Joinery hopes the clients will have an ongoing sense of wonder about the furniture, and that their enjoyment grows as the design's complexity, and depth of character, is revealed over time. With many clients, the furniture design process begins with sketching out ideas together. With others, they make pieces from their catalog, generally in a wood species of their choosing. Trained in the art of traditional woodworking, they build each piece by hand relying on such time-honored practices as dovetail joints and hand-rubbed finishes. The furniture will last for a long time, offering generations of utility and pleasure.